Move on over spring, and let summer begin…the new Classic Petunia Collection by Heartfelt Creations has arrived! No flower signifies summer more than the large trumpet shaped blossom of the gentle petunia! Surround yourself with memories of wandering through greenhouses filled to the brim with a multitude of varieties in every color, from solids to variegated, compact to blanketing and of course those showy hanging baskets and container gardens spilling over with these heat loving flowers! The becomingly illustrated cling stamp sets found within this collection will have you planning your very own garden themed paper crafts filled with trailing petunias, bountiful bouquets and lavish petunia filled hanging baskets. Three sizes of coordinating stamp and petal die cuts will allow you to recreate the ever popular petunia, making it easy to cut and shape the perfect blossom in the ideal size and color necessary for any project from handmade cards, scrapbook layouts and even altered art pieces. A beautiful selection of premade card panels and scrapbook pages filled with illustrations of graceful petunias in hanging baskets, classic terra cotta pots and pretty garden scenes showcasing elegant petunia draped wishing wells and white washed garden benches allow for ease in creating any garden variety creations. Filled with classic petunia pinks and deep purples along with pretty leaf like greens, the delicately patterned papers in this charming paper collection will transport you to your favorite garden plot! So join with us as we usher in the summer season with the tender flowers of the new Classic Petunia Collection….no fertilizing, deadheading or watering required! We promise! Seedless Preserve & Forest Moss Distress Inks, Black Archival Ink, Ebosser, Martha Stewart scoreboard, WRMK Envelope Punch Board, Spellbinders Lacey Ovals Die, Spellbinders Labels & tag die, white cardstock, pearls & adhesive. Take a 8 1/2" x 8" white cardstock & score at 3 14" & 6 1/2". Rotate 90 degree & score at 1/2" & 8". Cut off the 1/2" flap on both sides on the 1st & 2nd equal sections. Punch the notch in the center of the edge of the 7" x 2" section of cardstock using WRMK Envelope Punch Board. Fold & glue the 1/2" flap on both sides of this section to make the pocket as shown. Die cut the top edge of the cardstock with Delicate Border Basics Die. 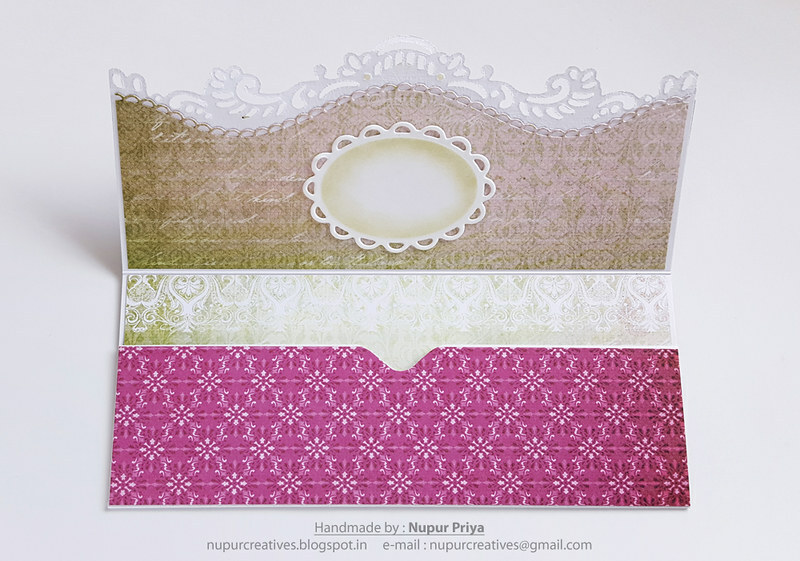 Decorate the envelope with papers from Classic Petunia Paper Collection & Classic Border Basics Die. Die cut a piece of white cardstock with Spellbinders Lacey Ovals Die, ink lightly with Forest moss distress ink using Stack and Store Daubers & adhere to the inside of the top flap as shown. Die cut another piece of white cardstock with Spellbinders Labels & tag Die & ink lightly with Forest moss distress ink using Stack and Store Daubers. Stamp the sentiment from Heartfelt Expressions Cling Stamp Set with black archival ink & adhere to the outside of the top flap as shown. Stamp & ink the flowers from Small Classic Petunia Cling Stamp Set using Seedless Preserve distress ink & die cut using matching dies from Small Classic Petunia Die. Stamp & ink the leaves from Tropical Paradise Cling Stamp Set & Small Classic Petunia Cling Stamp Set using Forest Moss Distress Ink & die cut using matching dies from Tropical Paradise Die & Small Classic Petunia Die. Shape these using Deluxe Flower Shaping Kit. Add a little Lemon Chiffon Prills from Spring Bling collection to the flower centers. Decorate the envelope with the flowers & leaves as shown. Add some pearls to add finishing touch to the envelope. What a clever idea! I love your petunias! Gorgeous, I agree, this is a fantastic idea! 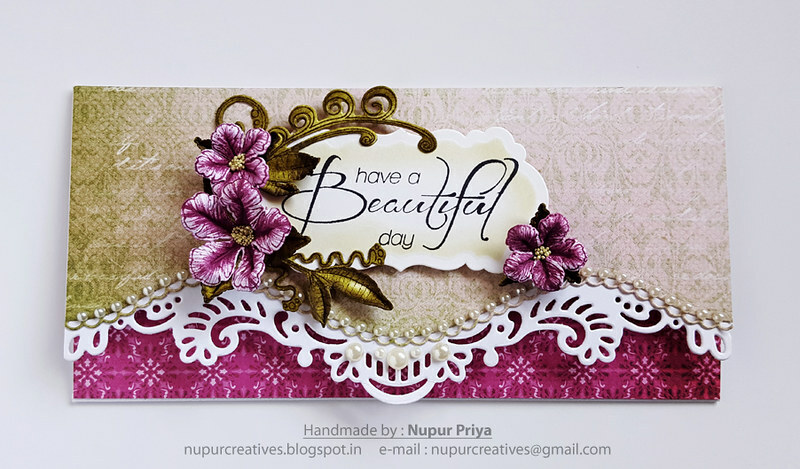 Oh, love your petunias and this gorgeous card Nupur! I love your gorgeous money envelope! So elegant! 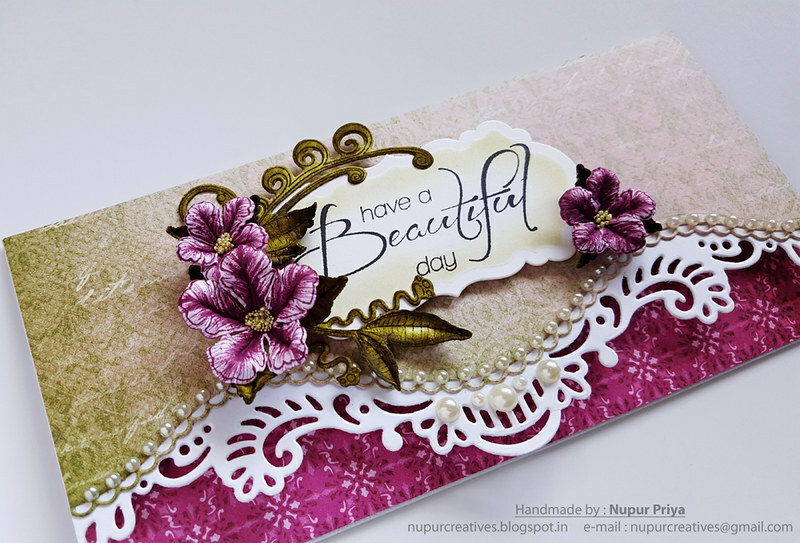 those flowers just pop Nupur, Beautiful and stunning project! Stunning...gorgeous coloring on the flowers!